Co-presented by ESPN's 30 for 30 Podcasts and IFP. THIS PAGE IS FOR APPLICATION FORMS ONLY. There is NO public event associated with this page.. thanks! 30 for 30 Podcasts is ESPN’s premium series of original sports audio documentaries. A spin-off of the Oscar®-and Peabody Award-winning 30 for 30 documentary series, the podcast utilizes original interviews, archival sound, and the textured intimacy of the audio medium to explore compelling characters, teams, incidents and stores across the sports landscape. 30 for 30 Podcasts Story Workshop is looking for the next great 30 for 30 Podcast. 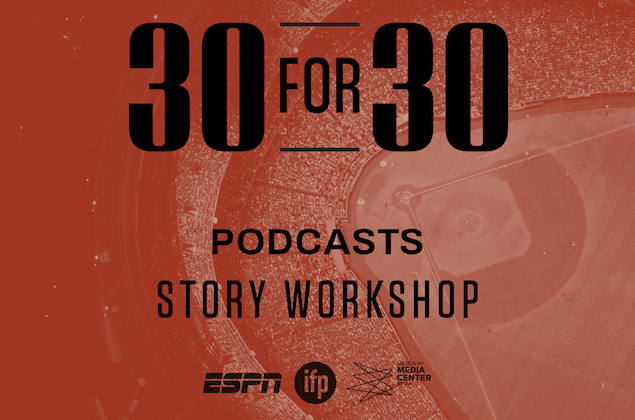 Powered by IFP (Independent Filmmaker Project) and the Made In NY Media Center by IFP, the 30 for 30 Podcasts Story Workshop is accepting submissions for original audio story pitches. Successful submissions (between 12-16 proposals) will be selected to participate in a private pitch session with 30 for 30 Podcasts and ESPN producers and development executives, at the Made in NY Media Center on July 24.